Residential / Commercial Pest and Termite Control Services for Fort Worth, Weatherford, Azle and surrounding areas. 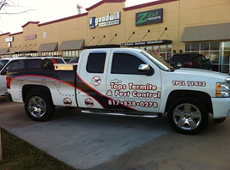 Tops Termite and Pest Control has been offering Quality Service, Attentiveness and Quality Termite and Pest Control Service in and around Fort Worth, Texas, since 1999. TTPC is a State Licensed, Insured and Bonded that offers expert termite and pest control service with Competitive Rates for Commercial and Residential. Everything Adapts Over Time and that is a primary factor in the Pest Control Industry. We use the latest pest / bug control products and treatments available to help solve just about any pest problems your home of business might encounter. *Enjoy Your Backyard! Tops Termite and Pest Control can aid in the threat of Mosquito Diseases such as Zika and West Nile. No Contracts required and traditional $65 Mist Treatments are available. Call or Contact via email -Tops Mosquito & Termite Pest Control. Answer any bug related questions you may have and offer the BEST customer service available. For your convenience we offer secure on-line payments. It is not necessary to have a PayPal account to utilize this service.